College is a time of experimentation for young adults. They are figuring out who they are, what they want and what they like. For some students, this leads to the misuse of various substances: alcohol, marijuana and even hard narcotics. In some cases, students turn to substances for seemingly good intentions, such as to improve their focus or the amount of time they can spend studying. Other times, their drug use is purely recreational. 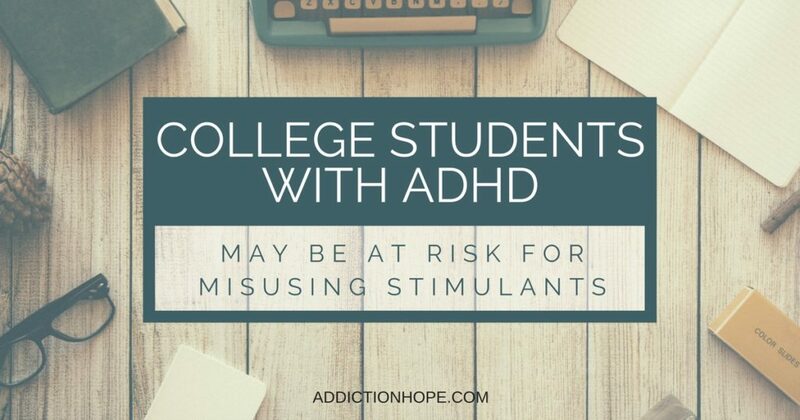 A recent study’s findings suggest that a correlation may exist between students with ADHD and students who misuse stimulants. This study was conducted by Massachusetts General Hospital on 300 undergraduate students between the ages of 18 and 28 who attended universities in the Boston area. The most telling result of this study was that one-third of the students admitted to misusing stimulant drugs. The study also showed that those students who abused these drugs were more likely to suffer from ADHD or have ADHD-related symptoms when they were children, such as difficulty focusing or sitting still for long periods of time. Adults diagnosed with ADHD often dislike tasks that force them to concentrate or require following specific instructions. The findings of this study are not surprising, according to Dr. Timothy Wilens, chief of child and adolescent psychiatry and co-director of the hospital’s Center for Addiction Medicine. Other studies have already proved that untreated ADHD correlates with higher incidents of alcohol- and drug-use disorders. “So it is not surprising that we found high rates of co-occurring ADHD and of stimulant use and overall substance-use disorders in those misusing stimulants,” Wilens stated. When interviewed about the Massachusetts General study, Wilens said that not all students who take stimulants do so with the sole intent to get high. “Some misusers may be pressured to use a friend’s prescription if they believe it will improve academic performance,” he said. On some college campuses, Adderall has become so popular for helping students with their coursework that it is often referred to as the “study drug.” This stimulant was developed to help people with ADHD control their symptoms. However, as many as one-fifth of college students take Adderall without a medical reason, simply for its beneficial side effects. Adderall is attractive to college students because it helps focus the mind, improve concentration and provide motivation. The drug is most often taken before a test or when students pull an all-night study session to help them stay motivated and concentrate on the course material. In late 2014, the Partnership for Drug-Free Kids conducted a study that found the misuse of prescription stimulants among college students is no longer a rare occurrence. All three drugs are prescribed for the treatment of ADHD. 27% of college students who abuse stimulants attend college while being employed full-time. 64% of students reported seeing benefits for using a stimulant, such as a higher grade or better competitive performance. Students who report stimulant abuse are more likely to be social, enjoy attention and consider themselves leaders, but they have trouble maintaining a work-life (or study-life) balance. The Massachusetts General and the Partnership for Drug-Free Kids studies report comparable findings: Among college students who abuse prescription stimulants, many are found to suffer from ADHD or similar conditions. If you have a child diagnosed with ADHD and who is coming up on his or her college years, start discussing now the risks associated with Adderall and other stimulants and how to best avoid the temptation of these drugs in college.